The maker of a popular line of kitchen DAB radios has turned in a portable radio that's stylish and works well. When switched on, the 1500 takes about two minutes to tune in. That's not ideal, but once the process has finished the sound quality is easily the best when compared to its rivals. Its FM tuner is also superior because when you switch to FM it automatically searches for the nearest station. A quick push of the joystick and off it goes to the next station. There's no RDS functionality, but station names are displayed for BBC stations. Otherwise, only the time and date can be toggled on and off in this mode. Sound quality is excellent, with very little sound interference. The 1500's predecessor, the 1000, was a lot more bulky and unreliable at holding reception while on the go, but it did have some very advanced features. Chief among these was the ability to record radio programmes on a SD card, which also played MP3s stored on it. It also had an optical digital audio output for hooking it up to an amplifier or Minidisk player. The 1500 does away with these features and costs half the price, but it's still more advanced than its competitors. 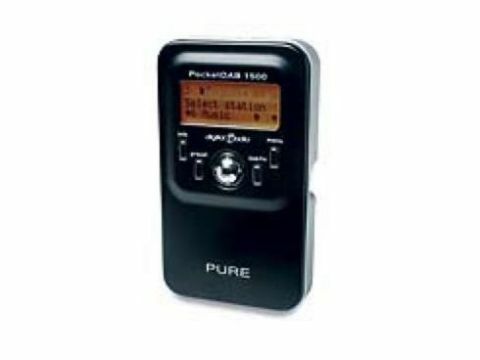 For DAB stations 10 presets are available and the menu system is altogether more impressive than other portables. EQ settings for vocal, bass boost, love and jazz and acoustic sound are provided, as are UK-specific and full scanning options. Available stations can be presented in a variety of ways and contrast levels and backlight levels for the orange LCD screen can be adjusted. The headphones supplied are easily the best around, and the styling and orange LCD give it a unique feel.